Yay! Another project to use your left-over yarn on! (Please click on the photos to enlarge the images). (Yes, that's me in the poncho). This was crocheted using a size J cabled afghan hook and left-over yarns consisting mostly of Red Heart and I Love This Yarns. 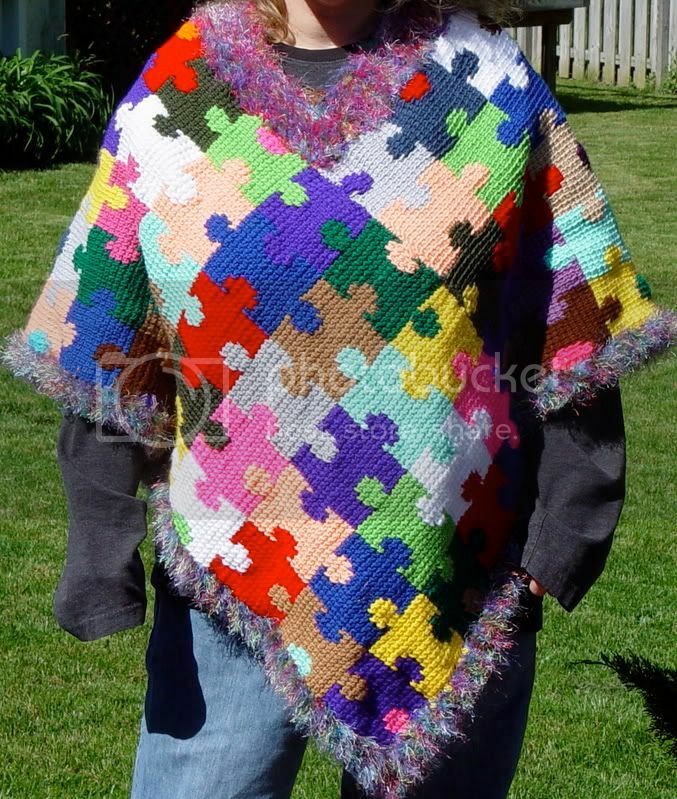 Here I've put my hands on my hips to spread out the poncho so you can see it all clearly. (I wish I had a photo taken with my arms at my sides from the back too but I didn't think of it at the time. The poncho is done Tunisian crochet style by repeating a small puzzle piece graph I made up myself using a pencil and graph paper. The popular "symbol" for autism is a puzzle piece or puzzle pieces. 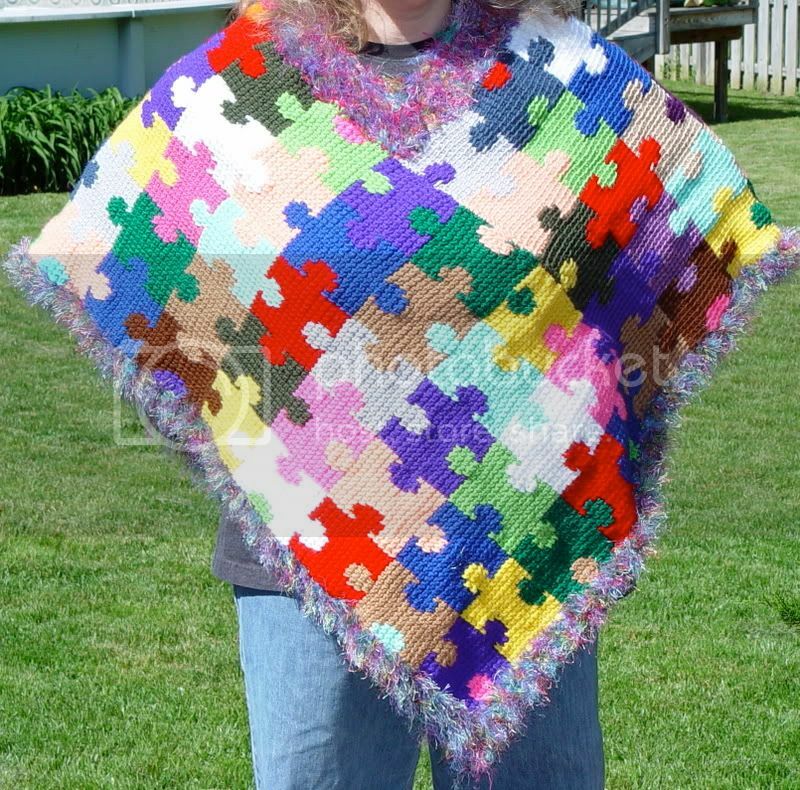 Especially made with different colored pieces. I thought this would make a nifty pattern. It is two seperate panels which I joined together after finishing them. The end of one panel is joined to the side of the other. And that panel's end is joined to the side of the first panel. (I hope all that makes sense). Finally, I trimmed the edges in single crochet stitch with a combo of Moda Dea's Chichi, (mmm, soooo soft), and Fun Fur. This stopped any curling that there was and also filled in the part around the neck to make it nice and toasty. Now, all I need is a nice cool day to wear it. (Too bad it's becoming hotter every day). 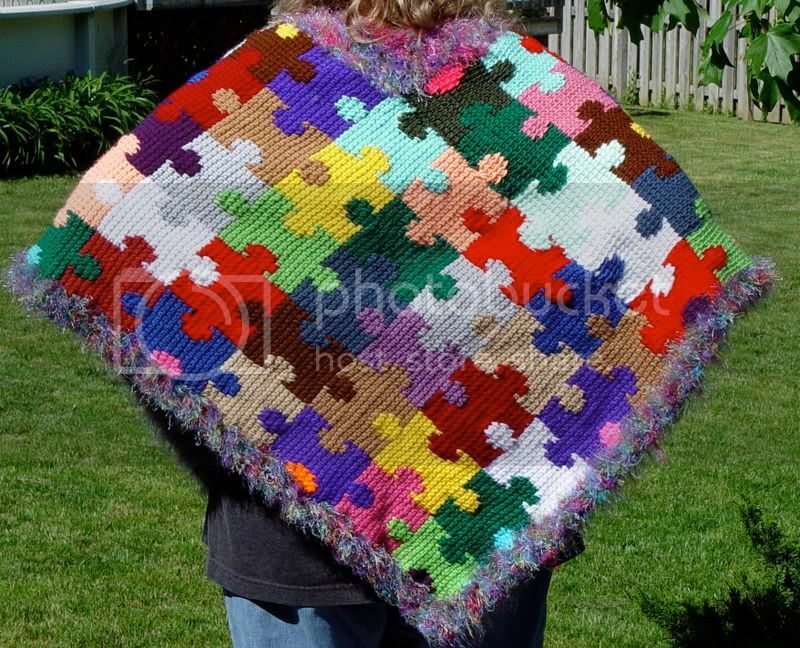 edit: I've added a puzzle piece scarf to the end of this post. I think it's page three. This is awesome. I have to learn tunisian... Did you crochet two rectanges and piece or is it all one? ETA: it would help if I read your post. doh! This is so neat, even before I read the title, I thought "hey this reminds me of those autism awareness ribbons." So congrats you nailed that one!! This would be such a neat project and would definitely motivate me to improve my tunisian skills. Even without the symbolism it very cool! This is really great! My youngest brother-in-law is autistic, I admire the effort you put in to raise awareness. What is your connection with autism, if you don't mind me being nosy? But I wanna know HOW you made such good looking puzzle pieces -- is it the afgan stitch that lets you do such perfectly interlocking curves? It's fantastic! Fantastic work with the design and ALL of those colors!! WOW!! I applaud you!! Awesome pattern and skill level. Beautiful colors together. shootingstar, my niece is autistic. She's my baby sister's youngest. She's really sweet and likes to knit! PimpernelSmith, even though the pieces are rounded, when you click on the photos and enlarge them, you can see that the pieces are still graphed in the usual "blocky" way. Thanks everybody for saying such nice things.